Rebecca Rebouche has a lot to be happy about. From the small bayou town of Franklin, Louisiana and current resident of New Orleans, this talented young artist has created quite the stir with her contemporary folk art, finding success and acclaim in all the right places. Her acrylic and mixed media paintings are part dream, part mother nature. As she shared recently, "I'm always using the natural world as my echo. There's always an element of magic or transcendence that you can never actually achieve in the real world with a photograph." Rebecca scored big when she struck a deal in October, 2010 with Anthropologie, a lifestyle retail chain that sells unique and beautiful women's apparel and home furnishings. 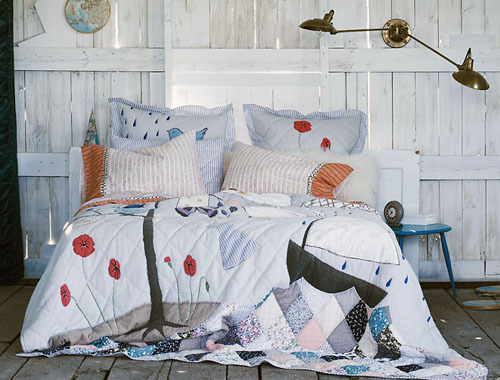 You'll find bedding, dishware, prints and wallpaper, all derived from her playful and pretty artwork that speaks well to her Southern roots. Rebecca, "I have created my sensibility and style of artmaking out of a love for crafty, sugary, folk, organic, honest, whimsical objects and settings. I am often exploring a metaphor for something that is essentially human and vulnerable." Through all her success, Rebecca finds balance at her home in New Orleans. It is there where she creates and paints in her studio just north of the city. It's where urban life subsides and the wilds of the deep South begins, revealing to her and all those who visit, its colors and textures, its rawness and grace. As if an Anthropologie collaboration wasn't incredible enough, Rebecca recently graced the cover of Garden & Gun magazine as one of their 15 Southern visionaries who are helping to shape the worlds of art, style and design. A wonderful accomplishment, and well deserved. To learn more of Rebecca's work, visit her corner store showroom in New Orleans or click here to peruse her Etsy shop.